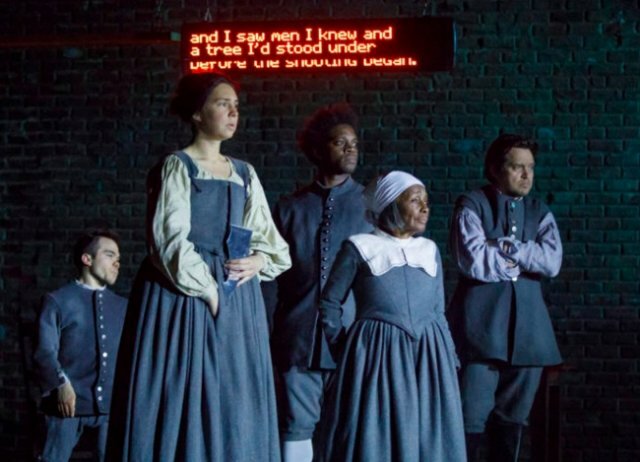 The presentation of Light Shining in Buckinghamshire by Caryl Churchill at the New York Theater Workshop takes the bold step of exploring the true roots of American democratic values as they emerged in the tumultuous years bracketing the English Civil War 1642-1651. Using excerpts from contemporary documents of the political debate and its religious expression, six revolving characters lay bare many of the issues which we, as Americans, often associate with the formation of our nation. Well-positioned subtitles help us move smoothly through the sometimes dense 17th century language. The staging is sparse.Thick wooden ties cut across the ceiling and add weight to the goings on. Yet a lovely scene in which an older woman describes actually seeing herself in a mirror in the manor home of a Lord needs no visual enhancement. Implicit rather than explicit costuming evokes the sense of time and place. Matthew Jeffers gives an outstanding performance in the many roles he inhabits. His hand and arm gestures provide not only a sense of character but of mood. He easily leaps from one level of the stage to another punctuating the move with pointed finger. Our context is not sugar-coated. The slavery like conditions of the majority of England’s population, the starvation and the punitive laws which prevented people from moving freely in search of employment, come alive in our glimpse of Buckinghamshire. The social position of women is well drawn, and eloquently expounded by the ever interesting Vinie Burrows. As she prowls over the stage, in command or confusion depending on her character, she is spellbinding. The opposition to this harsh system brings in many disparate voices. The poorest of the poor join non-titled wealthy men and women in the struggle to unite into an army. The first act culminates in the well documented Putney debate of 1647 which is our first record of a meeting where the question of one man one vote is raised within a governing body. That revolutionary idea was not accepted, but the core of the American constitution can be read within the issues in that debate. Much of this 17th century debate takes place in religious terms. They are well-expressed in the play by hymns which open and close the drama. Sound effects add both a sense of the enormity of the Stuart era and also its terrors. These are less part of our modern discourse on socio-political topics, yet this drama endeavors to speak to the human striving to find a spiritual and political realization of the best that we can be to ourselves and our fellow human beings.